The American Friends of Scotland's Canals & Waterways (AFSC&W) is a designated key partner charity of the American-Scottish Foundation. The American-Scottish Foundation is excited to engage with and promote AFSC&W's valuable work supporting the protection and conservation of Scotland's beautiful, unique waterways through the activities of Scottish Waterways Trust. This great partnership opens up opportunities for people and organisations in America to connect with a vital part of Scotland's history and heritage by joining AFSC&W as an American Friend, or supporting Scottish Waterways Trust's pioneering projects across Scotland with directed giving opportunities. After a fire this Spring destroying the Falkirk Hub Center, our Corporate partner Scottish Waterways Trust, have launched a crowd funding campaign to raise initial funding of 10,000 GBP. We’re grateful to funders the Heritage Lottery Fund, the European Union Interreg IVB North West Europe project ‘Green & Blue Futures’, Scottish Natural Heritage and Scottish Canals for enabling us to establish canal college. Now we’d like to include you, our American Friends, to continue this amazing work. The canal college Final Report is now vailable, downloadit and find out more. We’re sure it will inspire you to get involved. We are now actively fundraising for the $1.9 million we need to open canal college 2 in North Glasgow, Falkirk and the Highlands and run it for a further three years. 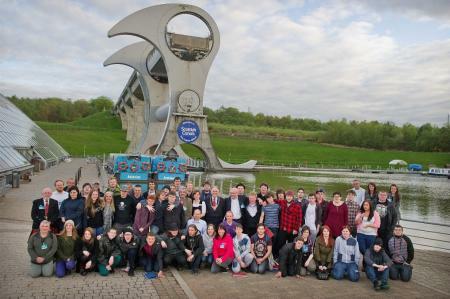 Sponsor a young person on the path to work and help them take the first steps towards a brighter future through innovative, outdoors employability projects on Scotland's waterways. Help us reach even more disadvantaged young people in Scotland and sponsor an innovative outdoors employability course. 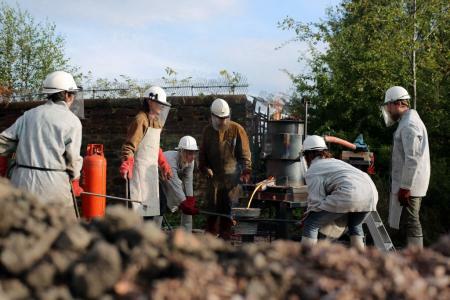 We’ve helped community groups and individuals indulge their inner Indiana Jones to help uncover the remains of a lost canalside ironworks on Glasgow’s Forth & Clyde Canal, as part of an innovative arts and archaeology project. The ironworks, which once sat on the banks of the canal at Applecross Street in North Glasgow, dates back to the industrial revolution heyday of the waterway in the mid-19th century. A soundscape created by artist Phillip Gurrey transports participants back to the glory days of the forge, conjuring roaring bellows, rushing water and the mighty clang of hammers on great anvils as part of an aural experience exploring Glasgow’s shift as a hub of industry to a beacon of culture. Local artists Minty Donald, Neil McGuire and Nick Millar have installed a temporary furnace on the site – the first time a forge has been fired within the walls of the foundry in more than a century. While today the waterway is home to social enterprises and cyclists rather than factories and coal scows, the Forth & Clyde Canal was once a transport artery that stoked the fires of the Industrial Revolution. Opened in 1790, the canal was used to carry passengers, goods and materials to and from the factories, foundries and warehouses of the city, playing a key role in Glasgow’s economic success. We are now actively fundraising the $77,000 we need to continue the Ironwork Archaeologists project. Why do we need your help? With your generous donations we can make a massive difference to the lives of people in Scotland. 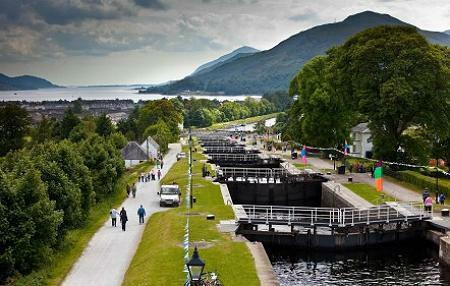 Join our waterways circle and forge a closer connection with Scotland's canals. Your generous help will enable us to carry out innovative work on our inland waterways and you will become a vital canal champion, engaging with our activities. Membership is annual and can be renewed from your joining date. Planned Giving, Planned gifts and bequests offer a donor income and tax advantages and may make a far larger gift possible. Planned Giving instruments include Bequests (Legacies), Charitable Remainder Trusts, Charitable Lead Trusts, Deferred Gift Annuities, Gift Annuities and Retirement Plans. We recommend you consult your professional adviser, accountant, attorney, or bank official to make arrangements for planned giving. A bequest of any size provides a gift for Scottish Waterways Trust in your will and is one of the simplest ways to support the inland waterways of Scotland’s future.